Abstract-Design of Analog Transmitter and Receiver using MOSFETS for optimization of power dissipated and maximization of bandwidth. Design of transmitter circuit according to current levels at the output and design of receiver using common gate amplifier cascade. Communication means exchange of information through signals. It can be of two types 1.Analog Communication 2.Digital Communication. Analog communication means the signals which are used are continuous in time domain and amplitude domain. Digital communication means the signals which are used are discrete in time domain and amplitude domain. For communication we need transmitter and receiver. Transmitter means a set of equipment used to transmit messages. Receiver means a set of equipment used to receive the transmitted signals. There are many factors to consider while communication they are: consider 1.Bandwidth 2.Speed of transmission 3.Noise immunity 4.Power dissipation 5.Signal attenuation. Hence our objective is to design an analog transmitter and receiver circuit with optimization in power dissipation and maximization of bandwidth. We design the transmitter and Receiver using Metal Oxide Semiconductor Field Effect Transistors(MOSFETS).We used MOSFETS to design the current mirror circuit and the differential amplifier circuit on the transmitter side and common gate amplifier on the receiver side. Clear cut design of transmitter and receiver is presented below. 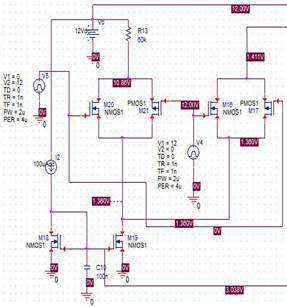 We give pulse as input signal and get dc current by using a current mirror. A current mirror is a circuit designed to copy a current through one active device by controlling the current in another active device of a circuit, keeping the output current constant regardless of loading. The current being 'copied' can be, and sometimes is, a varying signal current. Conceptually, an ideal current mirror is simply an ideal inverting current amplifier that reverses the current direction as well or it is a current-controlled current source. The current mirror is used to provide bias currents and active loads to circuits. It can also be used to model a more realistic current source (since ideal current sources don't exist). 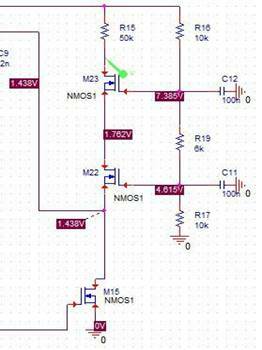 This setup only allows the current when gate voltage is very high. Here the voltage pulses we are giving as input are transmitted as current pulses through channel. 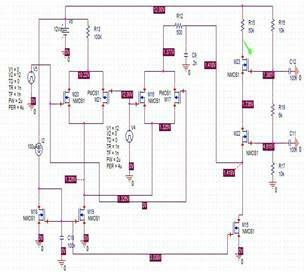 Clock is fed through and an alternative path is provided by another pair of MOSFETS so that there is always current flowing in the current mirror branch. There pulse is given in inverted form as input. The resistor values and (W/L) values are chosen so that all the MOSFETs are in saturation region as well as for getting least rise time. source or source follower. It is useful in, for example, CMOS RF receivers, especially when operating near the frequency limitations of the FETs; it is desirable because of the ease of impedance matching and potentially has lower noise. Gray and Meyer provide a general reference for this circuit. But the MOSFET connected to Rd should must have least W/L ratio to order to minimize the rise time (as W/L of a MOS increases the parasitic capacitances values also increases ).So to get higher gain and bandwidth we use cascade in which the upper MOS is having less W/L ratio where as the second one is with higher W/L ratio to get higher gain. But if we use feed which increases the bandwidth significantly will decrease the gain. That's why we preferred using cascade amplifier. The output waveforms are as follows. We get the output waveform as the pulse waveform which is input. There will be some distortion. Bandwidth depends on the input conductance high bandwidth means maximization of input conductance. Input conductance depends on the drain current and w/l ratio. 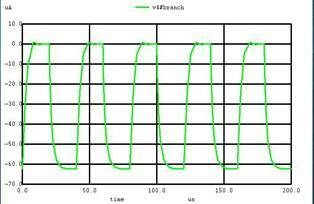 Input conductance can be maximized using high drain current and small w/l ratio or small drain current and high w/l ratio. Our target is to minimize total power dissipation for that purpose we use small drain current and high w/l ratio. But high w/l ratio means high rise time. 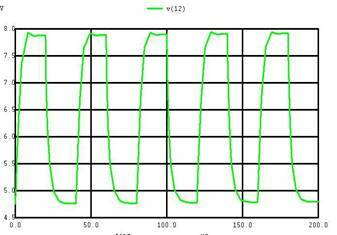 There will be more distortion in the output as compared to the input. Therefore we observed that by using low drain current and high w/l ratio not too high but to a certain acceptable extent we can design an analog transmitter and receiver with minimum power dissipation and maximum bandwidth.